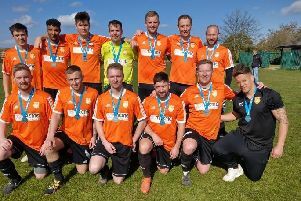 ICA Sports manager Hamish Curtis has passed all the credit for a ‘great achievement’ in reaching the Hunts Intermediate Cup Final for the first time on to his players. The city side booked their place in the late-season showpiece with a hard-fought 2-1 win at Cambs Division One side Bluntisham Rangers last weekend (January 14). Action from a recent game between ICA Sports and Netherton United. But ICA must pass a tough assignment if they are to lift the trophy. Eaton Socon, who are currently third in the Cambs Premier Division, will be their opponents. Nathan Glover and Connor Pridmore fired ICA 2-0 ahead in the first-half at Bluntisham and they survived a second-half fightback despite losing centrel defender Kane Gilbert to a red card. ICA are now unbeaten in their last six competitive matches, but they will do well to keep that run going tomorrow (January 21) when they visit Pinchbeck United in the quarter-finals of the Peterborough League’s President’s Shield. “It’s a very hard game for us at Pinchbeck,” Curtis admitted. “They are a great side with a great manager in Ian Dunn, but we are playing well and we go there full of confidence. “It’s a great achievement to reach the Hunts Cup Final for the first time, especially as we have quite a big injury list at the moment. ICA will now try and join Netherton United and Ketton in the President’s Shield semi-finals. The final quarter-final between Wisbech Town Reserves and Moulton Harrox has been pencilled in for February 5. The teams tried to play the game last Saturday, but an injury to referee David Stapleton caused an abandonment early in the second-half. Pinchbeck joined Netherton at the top of the table after beating Holbeach United Reserves 2-0 last weekend, but the city side should pull clear again tomorrow as they host struggling Stilton United at the Grange (2pm). Holbeach United Res v Crowland Town, Ketton v Thorney, Langtoft United v Uppingham Town, Moulton Harrox v Wisbech Town Res, Netherton United v Stilton United, Peterborough Sports Res v Leverington Sports, Sawtry v Deeping Rangers Res, Stamford Lions v AFC Stanground Sports. Pinchbeck United v ICA Sports.